We would love to hear from you if you have used One Time Wood Stain on your wood or deck. Please post a rating in the Consumer Star Ratings below. One Time Wood Stains consumer reviews below have shown issues with proper curing of the stain. We encourage you to read all the comment reviews. If you have any pictures of your experience with One Time Wood Stain, you can add them in the comment area with a detailed description. 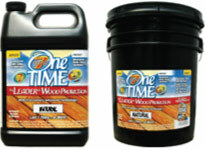 One Time® Wood Stain is a 100% solid stain that can be used on all types of unfinished exterior wood. One Time® Wood Deck Stain is a proprietary acrylate resin blend that protects by penetrating into the wood cells and cross-linking into the wood. One Time® contains no solvent or water to evaporate and cures in the full UV rays of the sun. The manufacturer claims a 7 Year Warranty on UV Fading, Water Damage, and Natural Weathering. – One Time Wood Stain had a decent look to the finished wood. Very rich in color. We did not appreciate the drying problems that the One Time displayed. This caused a slick/sticky appearance. – One Time® faded considerably in the full sun areas. About 40% of the original color had remained. The shaded part of the deck still had the stain left but unfortunately had darkened considerably. – One Time® Stain showed little to no peeling or wearing. This is the only claim by the manufacturer that actually lived up to its warranty.